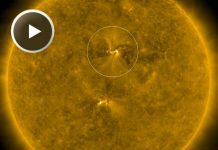 There Is Presently A Giant Filament Floating Over The Sun - Imminent Cataclismic Solar Storm? 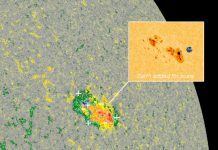 The solar observation probe SDO (Solar Dynamics Observatory) has detected the presence of a giant filament that hangs above the sun for several days at least. Huge because it is some 1.6 million kilometers long. But scientists do not know how long this mysterious feature will persist… Days? Or even weeks? This solar filament, long of 1.6 million kilometers was discovered floating over the Sun by the Solar Dynamics Observatory. 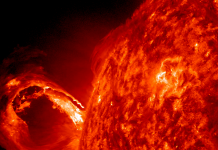 Such a structure is produced by an ejection of solar material composed mainly of hydrogen, calcium, and various metals in the form of extremely hot gas. The filament floats above the sun simply because it is pushed by the powerful magnetic field emitted by our star. Although this space phenomenon is not unusual, the length of the filament baffles scientists. Imagine that completely unwound, the filament would be about 40 times the circumference of the Earth. This giant solar filament was immortalized by the SDO probe in different wavelengths. Two of these pictures are presented in the picture above.